I get a little thrill every month when I flip my calendar to a new month and see all the blankness on that page. I love anticipating what the month will hold and I usually flip that page prayerfully. I get an even bigger thrill when I hang a new calendar for a new year. I have no idea what 2009 will hold for our family, but I can say without a doubt that I'm looking forward to living life fully this year. I like to take some time at the end of December to look back over the previous year and count my blessings--to see God at work in our lives and to treasure special moments. It was hard coming up with just one one per month...so I threw my own silly rule out the window. Rules schmules. I like to start the New Year with a clean slate. In all areas of my life. One area that is not so tidy right now is my Google Reader. I have over 300 unread posts, and as soon as I knock that number down a little, it goes right back up thanks to all you active bloggers! So...please don't take it personally, but I'm going to hit "Mark All Read" on New Year's Day and start fresh. We pulled into our driveway last night around 10:30 pm...I am tremendously glad to be home. I love our family, but I don't love traveling at Christmas. I did have a new toy to play with on the trip. My dad gave me an early Christmas gift when I was in St. Louis for his surgery--a Garmin Nuvii (gps). Very cool. I had a blast watching the elevation changes and thought it was cool to watch the clock change when we crossed time zones. What can I say? I'm easily entertained. There is nothing like sleeping in your own bed. NOTHING. And for some reason, coffee from our coffeepot tastes better too. My sister loaned me a book to read in the car yesterday, and I couldn't put it down. After it got dark, I tried reading by the light of my cell phone, but John told me I was going to hurt my eyes and made me stop. (Grinchy, huh? I think he really just got tired of long conversationless hours and wanted me to talk to him.) Anyway, the book was The Glass Castle by Jeannette Walls. I finished it up a little while ago...what an amazing story. Have you read it? People always ask me why we don't break such a long drive up into two days. We used to do that when our kids were smaller, but we actually prefer to drive it straight through. It's so disheartening to drive all day, unload the van, reload the van, and realize you have to get up and do it all over again the next day. We decided several years ago that it's just easier (and less expensive) to keep on driving. I have many things I want to post (and soon) including pics of our trip, my New Year's Goals, an idea I have for the month of January, and more...but first I have to make a grocery run and get the Christmas stuff put away. Wish me luck. Cousins, grandparents, turkey and dressing, Guitar Hero, a visit from dear friends, new clothes, ipods, puzzles, coconut cake (yum! ), sausage balls, a Chihuahua named Mac, singing and dancing to the tunes of a pink guitar, smiles on kids' faces and joy in their parents hearts. Yesterday was a good and blessed day. We're loading up Minnie-the-van today to head to my sister's house in Northwest Arkansas for round two of Christmas. It will be different, but just as fun I'm sure! Well, we made it to Arkansas, and are having a great time being with family! John's parents took us to eat fried catfish for dinner tonight...I was in heaven! I was going to post a few pictures, but I can't get our laptop to connect to their wireless network (frustrating) so I'll have to do that another time. I think I'm going to take a blog break for the next several days and enjoy the downtime. PS--If you have children...you simply must find and download the song by Sara Groves titled, Toy Packaging. I promise you'll be able to relate! We're heading out bright and early this morning for our 17-hour trek to Arkansas. I wish I were excited about the drive, but I'm not. After we moved here, I told my family that driving from Colorado to Arkansas (and back again) was a lot like labor. I needed to forget how bad it was before I was ready to do it again. It hasn't really been long enough for me to forget. I saw this over on Gretchen's blog and decided that if anything could put me in a good mood, thinking of my favorite things about Christmas could. So...here are my five favorite things about Christmas. 1. The music. Love, love, love Christmas music. I love the traditional carols and classics as well as the contemporary favorites. In case you missed my post about it, this is my favorite Christmas song. 2. The lights. Doesn't everything just look better with lights on it? I sure think so. 3. My children's delight. My kids love everything about this season. Decorating, baking, singing, Santa, the Nativity story, lighting Advent candles, shopping, funny movies, etc. You name it...it's all magical to them. And their delight is contagious. 5. The Christmas Eve service at church. I love going to church on Christmas Eve, especially if it's a candlelight service. I have to admit I didn't love it so much when my husband was the pastor because it was incredibly hard for me to manage toddlers and candles by myself! Break pretzel rods in half...as evenly as possible. Melt white chips in microwave in shallow dish (follow directions on bag). Dip pretzel rods to coat 2/3 of the rod (making sure to cover the broken tip with candy). I use a rubber spatula and get lots of candy on it, then roll the pretzel around to make sure it gets covered. Lay on sheets of waxed paper. Melt 1/3 bag of red chips in a ziploc bag. Cut off tip and squeeze in stripey fashion across pretzel rods. Repeat with green. Let cool completely, then store in airtight container. You'll have lots of extra red and green chips, but will probably use the all the white. One bag of white chips covers about 1 bag of pretzel rods. I bought 2 bags pretzels and two bags of white chips and had just enough with none leftover. These are so super simple and so delicious--the perfect blend of sweet and salty. I wrap them in clear, cellophane bags (I buy them in same craft section at Walmart) and tie them with cute ribbon and a tag. Easy-peasy! Yesterday I was helping Sarah download some music to her ipod (yeah, she has an ipod and her parents don't!) and she wanted some Christmas songs on it. It was then that I realized I haven't heard my favorite Christmas song this season. She had some itunes money left and was gracious enough to let me purchase it (secretly, she loves it too), and I keep listening over and over and over. (There is much rolling of the eyes when she catches me with her ipod. I have to ask permission first or pay her a quarter). Unto us is born. Unto us is born. Breathe our air and walk our sod. Perfect Son of God. Perfect Son of God. Congratulations to Ginger. Ginger, if you could privately email your info to me, I'll get the book mailed asap. It is one of my most favorite traditions. I've been working on my list today--collecting addresses that have changed or that I lost when my computer crashed in August. Tonight I hope to start addressing the envelopes and my goal is to get them mailed before we leave town. I ordered 300 cards this year. We have so many friends scattered across the globe. We don't keep up with most of them regularly (doing much better though thanks to blogging and Facebook!) but we love this tradition and wouldn't dream of not sending out our annual photo and letter. Most of the friends on our list are former church members and it's so fun when we hear back from them! Our return rate is pretty good--we get almost as many in the mail as we send out! I love, love, love going to the mailbox this time of year! So...what about you...do you send out cards too? Truth be told, I have a hard time choosing just one favorite but our annual trip to the North Pole in Colorado Springs is pretty hard to beat. We've been going for several years now, and it's such a fun day. Here are some pics from our trip last Friday. I took this picture while riding the ride pictured below. Is that not a GREAT Santa? I love the looks on their faces in this picture. Not only is there a fun mailbox for kids to leave their letters to Santa in, but there is a post office at the North Pole. If I'd had my Christmas cards ready to mail, I would have loved for them to have been postmarked "North Pole, CO". I hope to remember that for next year. I bought a photo like this of the three of them with Santa for our family photo album. I also bought an ornament for each of them with a pic of them alone with Santa. They're hanging on the tree next to the ornaments from previous year's visits. This ride is my least favorite...and this was the first year I didn't have to ride it with Abbey. I was thankful! Oh...you know those ads you see over there on my right sidebar? Well, thank you for viewing them when you visit here. The money I've made from having that advertising on my blog paid for our trip to the North Pole. Sweet, huh? Be sure to check out Kim's blog for more great Christmas tradition favorites! My sweet friend, Gretchen, writes a post every Monday listing ten happy things that make her attitude more along the lines of "glatitude". Don't you love that? While reading her list, I'm usually trying to come up with my own ten things, and today I decided to just start writing them down. 1. I'm glad that I have a warm, cozy house. I don't always love my house. Someone else actually picked it out for us, and we're not really friends with that someone anymore so there are days that I really struggle with living here. BUT, like I said, it's warm and cozy. It has been bitterly cold here the last couple of days and I'm also glad that our house is more than just a house...that it's our home. 2. I'm glad that we got to see the Christmas program yesterday at our church, and that our church is feeling more like home to us. 3. I'm glad that we were able to take a good family photo yesterday for our Christmas cards! Getting five people (and a dog) to all look and smile at the same time is a small miracle...just ask my friend, Lisa. I'm so tempted to post a picture, but I'm not going to just yet. John also finished our Christmas letter this morning. I think you'll like it! 4. I'm glad that yesterday was a true Sabbath for our family. My to-do list is lengthy these days, but I flung it aside yesterday and gave my body what it needed...REST. That stuff on my list will all get done. I'm sure of it. 5. I'm so glad that I have a compassionate husband who really "sees" me. While I was gone on Saturday, he cleaned the entire house for me and got me back on track with laundry. Last week was busy and I fell behind on so much stuff in the house. John stepped in and picked up the slack. I love that man! 6. I'm super glad to welcome two new babies to this world! One friend's baby girl arrived yesterday, and another friend is having a little boy later today. How fun is that? 7. Glad for some time spent with friends Friday night, Saturday, and again this morning. I have many friends, but the ones who know me best are such a gift to me! 8. Glad to see the sunshine today...even if it is only 5 degrees right now. 9. Glad to have made a dent in my Christmas shopping, and that I have time to knock out the rest this week. 10. Glad that this is a short week for my kids (and me)! Thursday is their last day of school until January 6! I am so ready for a break from homework and of having somewhere to go every single day! Glad that I found 15 Christmas cards in my mailbox this afternoon. And only two bills. Nice! Glad that I didn't get any speeding tickets today. Definitely an improvement over last Monday. For several years now I've wanted to make a small scrapbook with photos of all of the Christmas ornaments I've collected over the years. I started (sorta) last year with a series of ornament posts. I still need to finish the actual scrapbook, but because my mind seems to work more quickly than the rest of me, I had the grand idea this year to just make one big scrapbook about all of my sentimental Christmas decorations and the story behind them. So...I've been taking pictures of some of those things today. I guess technically, this isn't a tour of my home, but it is a visual tour of some of my favorite things. One of our four nativity sets. I bought shortly after John and I were married (deeply discounted) at Hobby Lobby. It reminds me of the brightly colored nativity set that belonged to my grandmother. My kids each have their own set that they keep in their rooms. Our Christmas tree. It's not fancy, but it's special to us and each ornament hanging on it's branches has a story to tell. I posted some of those stories here, here, and and here. We have hundreds of ornaments and they're each so unique and sentimental. This trio of snowmen look so perfect on top of my fridge. I bought this set one year in Camden, AR at the Tate Barn Sale. I LOVE them, and usually keep them out until February. This squirrel cracks me up. It was a gift to my husband from his good friend, Rich. There's a funny story behind it. Years ago when Will and Sarah were in preschool, John volunteered to go read to their classes. They went to a fabulous preschool that was on a college campus and all of the education majors did a practicum there. Anyway, one of the teachers chose a book for John to read that autumn day and it was about Mr. Squirrel and his lost nuts. The refrain on every single page was "Mr. Squirrel has lost his nuts...oh where do you think they could be"? All the college girls were cracking up while he was reading, and my pastor-husband turned about 500 shades of red. He endured to the end of the story, but he never volunteered to read to the class again. John shared that story with Rich a couple of summers ago in Santa Fe, and now Rich sends us all kinds of squirrel stuff. I don't know where he found this Santa squirrel holding a giant nut but it is priceless! This is my Christmas stocking that was hand-knit for me by my Nana. I'm 38 years old, and so is this stocking. I don't know exactly how many stockings my Nana made, but that side of my family is very large, and most all of us have one. However, very few of us have one with a Christmas tree on it. Lucky me. My mom knitted one for John after we were married, and one for Will too...but when the girls came along we switched to some beautiful needlepoint ones that we use instead. When I was in St. Louis a couple of weeks ago, my aunt had her stocking hung up on her mantle. It made me nostalgic for mine so I pulled it out when I got home. We have a great collection of Christmas books that we pull out this time of year. This is the traditional The Night Before Christmas and it's the version I grew up reading. It isn't the same exact book I grew up with, but is a newer edition that my sister gave to my kids many years ago. We always read it on Christmas Eve night. This cloth nativity was a gift from John's mom. I think it is so beautiful. Sarah sees it and says that it's "just all wrong" because Mary and Joseph weren't dressed that fancy when Jesus was born. She's probably right. Our Advent wreath. We lit the third candle at dinner last night. Now...I know that our candles aren't the traditional purple and pink, and I know you're not supposed to light the middle candle (Christmas candle) until Christmas Day, but that's just how we roll around here. Besides, these colors go with my kitchen a little better than pink and purple, and that white one in the middle is a yummy sugar cookie scented Yankee candle. That's all for now...but I'm already thinking of Favorite Christmas Decorations, Part II. 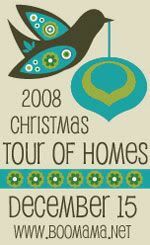 Be sure to visit Boomama's Christmas Tour of Homes for more beautiful Christmas favorites. One of the things I most look forward to during the Advent season is a one-day retreat hosted by the women's ministry at my former church. It is so nice to get away, quiet my heart and mind, center myself, and usher in the peace of Christ during this often chaotic season. I debated about going this year. Much has transpired in the last month or so that has me feeling a bit out of whack. Things feel hurried and while I'm not at the stressed out point (yet), I keep feeling like I need to maximize every minute of every day. Giving up an entire day felt costly. Especially since I've already been away from my family so much lately. However, I knew that going would be good for my heart (and it WAS). The Advent retreat is always led by my beautiful friend, Jan. I never fail to walk away from the day stunned at the ways she leads us into our own hearts and into the heart of God. As I was driving to the retreat yesterday morning, I was talking to God about the range of emotion I am feeling this year. Everything from worry to sadness to anger. I was also a little unsure of what I was stepping into because I was going back into the church that we stepped away from a few months ago. I have so many dear friends there, but was a little worried that I would feel a bit like an outsider this time. It sounds silly to even voice that, but if I'm honest I know that I can so easily undermine myself. So, while driving, I was praying and asking God to open my heart to receive what He had in store for me yesterday and I very clearly heard Him say to my heart, "Meredith, this is a day for you to feel loved on...by your friends and by Me. Just receive it...it is a gift." My tears started flowing immediately because I so needed that. I'm giving away a copy of this book. Advent is a season of expectant waiting. It is also a comprehensive waiting--we wait for the coming of Christ (his birth), we look for his second coming, but we're also looking and waiting for Him to show up in the daily-ness of our lives. I don't know about you, but there have been days and even seasons in my own life where pain and disappointment have reigned supreme and I've felt forgotten (dare I even say abandoned) by Him. Seasons where it has been easy to lose sight of HOPE. 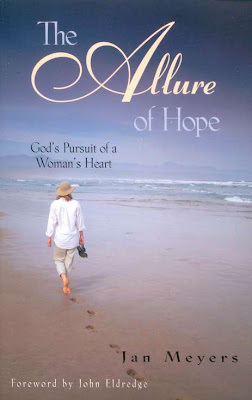 This book is about keeping hope alive in the midst of painful and disappointing circumstances. It isn't easy and it often takes tremendous courage, but it is necessary if we're to realize the beauty God wants to create in our lives. If you relate to any of this, then leave me a comment and I'll put your name in a drawing for this book. I'll close comments on Thursday evening at 9pm (MST) and draw a winner...just in time to get it mailed before we leave for Christmas. If you've read this book, and I know some of you have (let me just name some names--Julie, Jamie, Carrie) and want to leave a brief review of it, please do! I've been busy the last couple of days with Chritmas stuff, and I'm happy to say I've made a dent in my shopping list. I have all my teacher gifts bought, wrapped, and ready to deliver. That is a HUGE relief! I started on the kids' lists too...but I need to plan a shopping trip while they're in school next week. If I'm lucky, I might persuade coerce John into joining me. It feels good to be checking things off of my list! Thank you, thank you, THANK you for your great advice to my dilemna in this post. I love the ideas about asking my kids what tradition they can't live without this year. In fact, I asked them over dinner two nights ago, and they all said, "Opening gifts". Well, that's sort of a given, so I finally got them to tell me some things they want to bake and make and do, and some of those things might just get done while we're in Arkansas. Anyway, I'm feeling much better about this whole thing. Thank you! One thing we do every year that makes it feel like Christmas to me is take a trip to the North Pole. We're going today (they were closed yesterday) and I'm so excited. Highs are supposed to be in the 40s today which is warmer that it's ever been before when we've gone. I'm packing lunch and hot cocoa and treats and we're heading out in a bit to see Santa and ride every ride in the park! Should be a fun day. I'll post some pics this weekend. I keep wanting to continue adding to the ornament post series that I started last year, but time isn't really working for me. If you're really bored and want to see some of the memories hanging on our Christmas tree, here's Part I, Part II, and Part III. You'll be happy to know that I finally came up with something I really, really want for Christmas. This. Doesn't it look heavenly? I'll take any color except pink. Oh, and thanks Leigh Ann for the heads up! Have you seen this video? I've watched it countless times, and I love it. It's made me think twice about what I intend to buy this season. Two sweet friends (thanks Teri and Elizabeth) sent me a link to this post after I shared my disappointment about Christmas this year. It's so beautiful that I wanted to pass it on. I wish I had an inkling of my friend, Meredith's creative genius. Seriously, browse her blog for a minute and you'll realize she's got it going on! I promise you'll leave inspired to make something. I'm thinking that these would make fun gifts for some people on my list! Speaking of creative friends, check out Pet Panache, Nola Mae, and Addie Mae's Closet. I have some seriously talented (not to mention entrepreneurial) friends!!! I've reconnected with several OBU friends that have recently started blogging. I LOVE reading their blogs, and I bet you would too. Wanna join me in welcoming Whimzie, Carpool Queen, and Christi to the blogging world? And (Becky) if you want to start a blog (Becky) please (Becky) let me be the first to know about it. Well, my allotted time at the computer is up. So much to do...bye for now. As a mom, I feel a lot of pressure this time of year to make things beautiful and magical for my family. Over the years, we've created so many traditions that are special to our family. I love sending Christmas cards out to our family and friends. I love making gingerbread houses and other special holiday treats (though I don't necessarily enjoy doing it with my children). I love Christmas crafts. I love lighting the candles of our Advent wreath at dinner, and I love all the sentimental decorations we have around the house. I love parties. I love making and delivering gifts to our neighbors and friends. I love wrapping gifts and I love all of our Christmas Eve and Christmas morning rituals. I'm not extraordinarily busy these days, but I have a bajillion things that I want to do to make this season special for my family. Most are things that really make it feel like Christmas to me. I'm already so behind on so many things I want to do, and because we're traveling this year, I'm QUICKLY running out of time to do them. Which brings me to my current dilemna--How do I decide what is most important? What things can I let slide? if I let something slide, how disappointed will my family be? How will I handle my own disappointment? Right now, I think I'm grieving the loss of what I want this holiday to be. John and I talked to the kids after dinner tonight and explained that this year is just going to be a little different. We'll be somewhere else on Christmas Eve/Christmas Day. We may not have time to make all the cookies and treats or do some of the things that we normally do. They are disappointed about some things. Truthfully, so am I. Realistically, I know that I can't do it all but I sure do want to. I'm all about slowing down and simplifying, but this year it feels like my already simplified season is being pared down even more. I'm struggling a bit...and praying that it will still be special and beautiful and magical for my family. Ever have one of those days where things just start off badly? Yeah, me too. After being gone last week, I guess I sorta forgot my morning routine and I lazed around in my pjs a bit longer than I should have. I glanced at the clock and let out a little gasp before getting the girls fed and dressed for school. After John and the kids picked me up at the airport on Saturday, we stopped for dinner and then did a little shopping at Old Navy. They had jeans on sale for $12 and everyone needed a new pair. The girls found some they loved and had to have, but I'm wondering where the love was this morning. They both cried and refused to wear their new jeans (for various reasons) and I ended up yelling at them. Not one of my prouder parenting moments, but I snapped and it wasn't pretty. A few minutes later my sister called me and told me that my dad is having a hard time being a patient and seems to think he knows more than his doctors do. It's exasperating, and I feel guilty that she's having to deal with this stuff alone this week. I needed to talk to her, but it made me a little late getting out the door. Well, that and the fact that Abbey had to completely change her clothes, and then she forgot to put her coat back on, and then I couldn't find my purse. I finally gave up and jumped in the van without it. Bad idea. Very bad idea. I didn't realize I was speeding until I saw the police car turn his lights on and pull behind me. I was going 10 miles over the speed limit. Busted. I explained that I didn't have my license because it was in my purse and my purse was hiding in my house. I could tell the policeman wasn't happy with me. I started crying, but the law had no mercy this morning for crying mamas. Thankfully, he only ticketed me for speeding and let the driving without a license part slide. Since this also seems to be true confession time, I should tell you that I pulled my seatbelt on after I stopped. If you're counting, that's THREE offenses. Bad, bad, bad. Don't lecture me, please. There's probably only one thing that Sarah inherited from me and that's my punctuality. The girl HATES being late. I calmly explained to her that she was going to be tardy today and that I was extremely sorry. I was sorry for myself too because I took them to school wearing my ratty jeans and fleece top. My hair was CRAZY, I hadn't brushed my teeth, I had on no makeup, and because I wasn't expecting to get out of the car, I wasn't wearing any undergarment support if you know what I mean. If your kids are tardy, you have to walk inside and sign them in. Oh, and did I mention that I was still crying? Nice. I decided it was too early to start drinking anything stronger than Starbucks, so I jumped in the van with the intention of driving (slowly, slowly, slowly) to the nearest one. But then I remembered I didn't have my wallet since I didn't have my purse. Let's just say it was a tough morning. At this point, I decided that things could only get better. I called John and he was super cool about the ticket. Huge relief. I didn't think he'd be mad, but I hated telling him that "oh, I did something stupid and now I have to pay $$$". I stuck my hand in the pocket of those ratty jeans and found $. That hardly ever happens to me. Yay! Starbucks money! I called to make a hair appointment and got one for TOMORROW!!! I normally have to wait several weeks! Went to the store (drove s-l-o-w-l-y), got everything I needed in record time, and got home before it started snowing. Now, I'm off to make a big pot of soup for dinner and am ready for everyone to get home and get in their pjs and spend this snowy evening together. Minimal homework would be nice, but I'm not pushing my luck. I'm very glad to be home after being gone almost a week, but as you can imagine, I hit the ground running. I have a few things to do this morning (before it starts snowing again) but I wanted to pop in and say Hello! I'll be back with a real post once I've shopped and mopped and crossed a few more things off my list for today! In the meantime, enjoy this fun Christmas meme that I saw on some of your blogs yesterday. Happy Monday. 1. Wrapping paper or gift bags? I like wrapping paper. Just wish that the scotch tape didn't disappear. It doesn't matter if I buy one roll or five...I always have to search for it when I start wrapping. 2. Real tree or Artificial? Artificial, pre-lit--because we have allergy issues. 3. When do you put up the tree? Usually the day after Thanksgiving. We did it early this year though. 4. When do you take the tree down? The day after Christmas. 5. Do you like eggnog? Blech. 6. Favorite gift received as a child? Roller skates, maybe? I don't know. 7. Hardest person to buy for? You know, we generally only buy gifts for the kids in our family/extended family...so I don't know that I have a hard person to buy for. 8. Easiest person to buy for? My children. 9. Do you have a nativity scene? Four, actually. One belongs to the family, and the kids each have their own. John's mom bought them each a starter set when they were babies and adds a new piece to it every year. They keep them in their bedrooms this time of year and the girls play with theirs daily. 10. Mail or email Christmas cards? Mail! 12. Favorite Christmas Movie? If forced to choose a favorite, I'd say Christmas Vacation, but I have a TON that I love. 13. When do you start shopping for Christmas? Mid-December. Obviously, I haven't started shopping yet. 14 . Have you ever recycled a Christmas present? Maybe I have, maybe I haven't. I guess you'll just never know now, will you? 15. Favorite thing to eat at Christmas? Chex mix and sausage balls. 16. Lights on the tree? Of course. I like white, but John likes colored. Guess which we have on our tree? 17. Favorite Christmas song? Hark the Herald Angels Sing. 18. Travel at Christmas or stay home? I prefer to stay home with my peeps. This year we're traveling. 19. Can you name all of Santa's reindeer? Yes, can you? 21. Open the presents Christmas Eve or morning? Christmas morning. Sometimes I give in and let the kids open one. Not often though. 22. Most annoying thing about this time of the year? Traffic, crowds, and wasteful spending. 23. Favorite ornament theme or color? Our tree is so hodge-podge. There is absolutely NO theme which makes me love it more. It's just full of memories--new and old. 24. What do you want for Christmas this year? You know, there is not one thing I need. I'm happy just being with my family. Can I keep going? 'Cause this one is easy! 1. Slept until 7AM. It was wonderful. 2. Made a LOT of lists and got things ready for me to be gone all week. 3. Enjoyed the snow that fell almost all morning and afternoon. 4. Finished up the leftovers from Thanksgiving dinner. 5. Watched Pride and Predjudice. 7. Stayed in my pajamas ALL DAY. 8. Read every single post in my google reader! 1. My dad's surgery being over. 2. Seeing my sister, brother, and aunts in St. Louis. 3. A possible visit to Trader Joe's while in St. Louis. There aren't any in Colorado! 5. Christmas break and the kids being home. 6. Getting lots of Christmas cards in the mail. 7. An Advent retreat next week. 8. John and Jen's Annual White Elephant Party. 5. A date with John...and soon! 8. Someone to do my Christmas shopping for me! We have some friends in Arkansas that adopted twins from Guatemala a couple of years ago, and the day that they brought those precious children home is known at their house as "Gotcha Day". We had a little Gotcha Day celebration of our own on Sunday to mark the day that we added Jack-the-Beagle to our family! He has been a really good fit for us! My kids love him to pieces, and he is ever so patient with their smothering affection. and since it snowed here all day, the kids went out and played in it with him! He loves the snow... I love to watch him run and jump around in it. And it totally cracks me up when he buries his face in the snow! Doing what Jack does best! Remember my post about not being very limber? Yeah, well, I'm on the fast track for learning to bend. I'm flying to St. Louis this afternoon for my dad's surgery. It got bumped up to tomorrow. We learned that while en route to Arkansas for Thanksgiving, and turned the van around and drove home so I could get things squared away to leave today. Yesterday, the one inch of snow we were supposed to get turned into fourteen and today schools are closed (not in the plan) and my ride to the airport fell through (not in the plan) and I'm having to bend in all sorts of ways I didn't expect. Thankfully things have worked out beautifully. My husband and my neighbors have been exceedingly gracious with their time. I'm so grateful. So...I'm leaving for the airport in a little while. I'd appreciate your prayers for my dad, my husband, and my children this week! It's hard for me to leave my little family, but we all feel that I need to be there with my dad. Gracias, amigas...from your very pliable, bendable, LIMBER friend!